"Hit to right, Bass going back, going back…it's gone! A two-run home run by Lenny Dykstra, and the Mets beat the Astros, 6-5!" As a lifelong, diehard Mets fan, I feel a little bit guilty not having a sentimental attachment to Shea Stadium—it's where I saw my first ballgame (Jerry Koosman vanquishing the evil Phillies), and where I've seen more games than anyplace else. But even those of us who love the Mets would have to acknowledge that the team's home since 1964 is kind of a dump, a product of an unfortunate period in stadium architecture, and many of its aesthetic brethren (Riverfront, Three Rivers, the Vet) have already been consigned to the circular, multi-purpose ash heap of history. Shea comes down this year and CitiField goes up next door; its demolition is also one more thumbing of the nose at the legacy of Robert Moses, who thought of Shea as his Colosseum, but one that didn't even make it to a fiftieth anniversary. 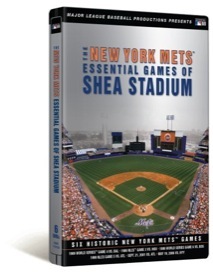 Anyway, this DVD set offers six games from Shea's history, not all of which is glorious. Disc One brings us Game 4 of the 1969 World Series, when the greatest pitcher in the history of baseball, Tom Seaver, vanquished the Orioles on the way to the Mets' improbable first championship. It features many of the icons of the age, including dangerous character Cleon Jones and gritty Jerry Grote; throwing out the first pitch is first Mets manager Casey Stengel, seated with commissioner Bowie Kuhn, and in the opposing dugout, in their ornithologically incorrect caps, are legends like Frank Robinson and Brooks Robinson, manager Earl Weaver, and future Mets manager Davey Johnson. Lindsay Nelson and Curt Gowdy are your broadcasters, and this truly brings us to another time. Disc Two jumps ahead seventeen years, and one wonders about the choice of material for this set, actually. Where, for instance, is a single game from the Mets' pennant-winning season of 1973? The obvious choice is the playoff brawl between Bud Harrelson and Pete Rose, one of the great onfield fights in baseball history. And what about Dwight Gooden's 19-strikeout game, a religious experience for some of us? Anyway, there's no quarreling with the '86 games, starting with the third game of the National League Championship Series, made most memorable by Lenny Dykstra's bottom-of-the-ninth walkoff homerun; and then there is Game 6, on Disc Three, Bill Buckner's error of infamy. Things kind of fall off in a hurry—Disc 4 is the 1999 League Championship Series Game 5 win over the Braves, featuring Larry Jones, Andruw Jones, and Greg Maddux, an epic 15-inning affair, for which your broadcasters are Bob Costas and Joe Morgan; the Mets roster includes recently retired Mike Piazza, and the starting pitcher that day was Masato Yoshii. Again, not a single game from 2000, another pennant-winning season? Disc 5 holds a game more notable for its context than its content—it's the September 21, 2001 game against the Braves, the first game played in New York after the attacks of September 11. The pregame ceremonies remain extraordinarily moving, featuring salutes to the fallen, Diana Ross singing God Bless America, Marc Anthony singing the national anthem, and special guest star Liza Minnelli, with an NYPD/FDNY kickline at the seventh-inning stretch, giving a cathartic rendition of New York, New York. Even #1 Yankees fan Rudy Giuliani was at the game. Finally, Disc Six is a 2006 interleague affair, Mets over Yankees, and is a reminder of how quickly rosters turn over, for featured players here are Randy Johnson, Bernie Williams, Paul Lo Duca, and Kaz Matsui. It's hard to imagine wanting to sit through any of these in their entirety, but having them on DVD is a comfort, and is a lot cheaper than seat licenses in the new park. Image Transfer Review: As you might anticipate, the older broadcasts look the most ragged, though it's heartening, as late as the 1980s, to see ballplayers who don't look like overinflated Macy's Day balloons. A perfectly reasonable if unspectacular transfer. Audio Transfer Review: Nothing special on the audio side either, though a chance to ruminate again on what might have been included—not a peep from Bob Murphy, the longtime Mets radio broadcaster and, for those of us who grew up in New York, the voice of summer, nor a word from malaprop master Ralph Kiner on his eponymous postgame show, Kiner's Korner. Extras Review: Disc Six holds all eleven featurettes, quick takes on Mets greatness over the years. Would that there were more. There's the last half inning of the 1969 World Series, with Davey Johnson making the final out and the Shea fans going bonkers; Gary Carter's 1985 Opening Day home run; and lots of goodies from 1986, with the Mets clinching the division, and highlights of World Series Game 7 with the ageless Jesse Orosco. Then we jump ahead to 1999, with a Matt Franco interleague home run against the Yankees (the crosstown rivalry is much overplayed on this set), and Todd Pratt's homer in that year's division series against Arizona. We actually get to see the Mets clinch the 2000 pennant, against St. Louis; pitching is Mike Hampton, who left New York for Colorado, not for the money, but the schools. Ahem. Then it's three from 2006: a montage of walkoff moments, clinching the division, and Endy Chavez's epic catch against the Cardinals, all of which are cold comfort without a pennant. Finally, there's a brief conversation with the stadium's namesake, Bill Shea, on the construction of the park back in the day. A somewhat questionable roster of games played at a much-unloved stadium, this set still provides plenty of choice memories for Mets fans. Whether at Shea or across the parking lot in CitiField, you gotta believe.